The Florida Project, a brilliant new film by director/screenwriter Sean Baker (Tangerine, Take Out) explores the precarious world of people living just a few dollars short of homelessness through the ears and eyes of six-year olds. Baker balances adult desperation and childlike optimism, an enigmatic blend that creates a gripping story centering on an important if neglected rung of America’s socioeconomic ladder. It also may well earn The Florida Project a spot on the short list for several categories in the next round of major awards. The story opens with six-year old Moonee (Booklyn Prince) sitting with her back against a wall, her feet and legs impatiently unsettled as she waits for something to do. She and her friends live in an extended stay hotel near Disney World, and they have free reign as their parents either work at low-wage jobs, watch cable, or simply fail to keep up with their comings and goings. Like all six-year olds, they don’t do well with inactivity. They will find ways to entertain themselves. The breadth of this phenomenon is artfully shown by Baker when Moonee gives a “tour” of her hotel to her new friend Jancey (Valeria Cotto) who lives in a similar hotel down the street. Moonee leads her friends into a utility room–after warning them they are never allowed to enter–and proceeds to shut off the electric power to all the rooms in the hotel. As rooms darken and air conditioners shut down in Orlando’s stifling summer heat, virtually every room in the hotel opens, revealing a vast and diverse community of families, couples, singles, and children. Moonee’s story now represents an entire subclass of the economy. But the economic desperation of the parents doesn’t phase Moonee, Jancey, or her best friend Scooty (Christopher Rivera). They fill their unsupervised days with adventure and imagination, celebrating the mundane as if it were a newly discovered wonder. They pull pranks, they manipulate adults with their pretended innocence, and explore the edges of their physical world without understanding or considering the consequences. In other words, they act like six year olds, living in the moment, untrampled by the burdens of adulthood. Even a field of cows becomes a creative and fanciful treasure for their imaginations. Managing the motley collection of single moms, couples, transients, and others left off the highway to the American Dream is Willem Defoe (Platoon, The Grand Budapest Hotel, Spider-Mann films), in what may be one of his best performances to date. His turn as hotel manager Bobby Hicks reveals a man worn down by the challenges of coping with a dead-end job in a fully rented cheap hotel. He is, nevertheless, able to harbor enough humanity and compassion to embrace Moonee and her mother Halley’s (Bria Vanaite) free, if irresponsible, spirit. Hicks, much like the hotel’s residents, is trapped in this world, unable to break out even as he sees the lives of those around him spiral out of control. The adult characters evolve, but into dark or seemingly hopeless places. Unwilling to bend to convention, for example, Halley descends into increasingly desperate and shady work. As her life spins further out of control, and the danger of losing Moonee to foster care increases, her anger mounts. She becomes more and more violent as she lashes out at friends, leading to an inevitably heart-breaking conclusion. The ending has been widely criticized, but fits well within the movie’s focus on the primary point of view of children facing daunting and overwhelming circumstances. The Florida Project, despite an astonishingly meager $2 million production budget, may well emerge as a sleeper hit. The movie is strong enough to earn a nomination for best film. Baker could easily get several nods for his directing. His approach to the story is subtle, using the innocent eyes of children to frame the choices of the adults who attempt to cope under desperate circumstances. Brooklyn Prince, despite her youth, is a break-out star—spontaneous, believable, and faithful to the undisciplined and irreverent character she plays–as is Instagram sensation turned actress Bria Vanaite in her debut feature film role. The Florida Project is a deliberate piece of social commentary. Sean Baker has earned a reputation for making indie films with substance and conscience. 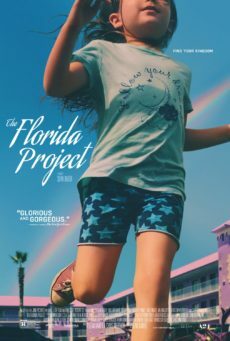 He has designed The Florida Project as a meditation rather than an outright statement, giving the film an unconventional structure that also allows viewers enough space to draw their own conclusions. Baker allows the film to develop at its own pace and pulse, in part by encouraging improvised dialogue and scenes to give the characters and their adventures freshness within the framework of the story and script. Audiences have been less kind than critics to The Florida Project, and this may have to do with the content. The film points directly at the underbelly of the American labor market and economy, a large section of the labor force that is either underemployed or unemployable in higher paying jobs. Nevertheless, Baker has pulled off an excellent piece of filmmaking, an example of what craftsmanship can do with a fresh lens and the ability to help raw talent shine in ways that serve the story.